Bitcoin Hack (BitcoinHack.Net) is supposedly some new trading system that was created by the real developer bitcoin which can make you thousands of dollars per day. But is this really true or is it just another scam? Unfortunately… It is the latter. Bitcoin Hack it is not the real deal and is definitely not something anyone should be getting involved with. The only thing that will come from getting involved with this scam is a massive loss of money. In this review I’ll be exposing the Bitcoin Hack scam to the world so that hopefully less people will get scammed by it. I’ll be going over what they tell you, how it supposedly works, the lies that you are told, how they actually scam you out of your money and more. If you are possibly thinking about buying into this trading system then you are definitely going to want to reconsider and read over my review here. This scam is comparable to some other scams I’ve reviewed recently like Bitcoin Profit and CryptoRobo. 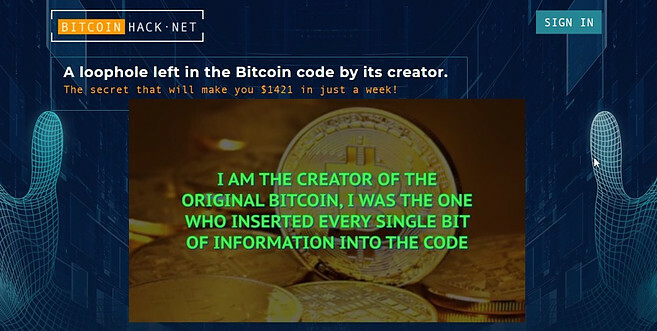 When you land on the website for Bitcoin Hack there is a video presentation that was supposedly created by the real developer of bitcoin, who claims that Satoshi Nakamoto is just to the public thinks created bitcoin, but really you have been lied to all this time. There are two separate videos, there is the first video presentation and then another one plays after you enter your email address for more information. In the second video he tells you that himself along with Satoshi were developers on the bitcoin project, but Satoshi betrayed him by presenting all of the work as his own, acting as if he had single-handedly developed bitcoin. We never did find out the “real” developers name, because he says he needs to keep it a secret. This is unfortunate because I am unable to verify or look into him any further, but I guess no one really knows anything about Satoshi Nakamoto either. The guy claims that the bitcoin code has been developed to make future price fluctuations, which the thought of sounds absolutely ridiculous. If the price of bitcoin drops… That was supposedly because the code told it to drop at that time. If it goes up… That is supposedly because the code told it to do such. He claims that the price is 100% predictable based on the code, but of course most people don’t know this. The purpose of him creating this new trading system is to get money back into the hands of the people. He is upset with the direction that bitcoin is taking and decided to step in and do something. Ya… I think we can all agree on that. And as you will see, after I go over how this trading system supposedly works, it is definitely too good to be true. Much about this system I go over in my 10 Ways to Spot a Cryptocurrency Scam post. Well of course there is virtually no information told about how it actually works. He says that he just develop some new trading system that hacks into the bitcoin code and brings you profits. It is all based off of how the code leads to the price fluctuations, so it is completely predictable if you actually know the code. He says that it exploits something to do with bitcoin wallet addresses and gives everyone an equal daily payout, who is able to tap into the system. While this may sound like a plausible statement, it is easily disproven and anyone who has been following bitcoin for some time probably knows this is not true. The truth is that the bitcoin code is far from what it originally was. So even if this guy were the real developer in the beginning, the code would have underwent massive changes over the years. Why? Well… Because bitcoin has had a lot of problems that have needed to be fixed, and still need to be fixed. The development team, which consists of hundreds of people, is constantly working on updating the code and making bitcoin more efficient. For example, there were changes made with the block size, there were new layers of code thrown on top of the main layer, such as the lightning network which made extremely fast transactions possible, and so on. There have been many changes made to the code, or additions to the code, and this is continuing to happen. This is how this trading system supposedly works… Of course he knows what the price is going to do so he can make profitable trades. It doesn’t matter if the price drops or rises… If you know the outcome you can make tons of money. However, this is a complete lie. The price fluctuations are not determined by Bitcoin’s code, they are determined by the market… The people buying and selling bitcoin. There is absolutely no way to predict with 100% accuracy where the price is going to end up. You have no idea if the sellers are going to sell more than the buyers, dropping the price, or if the buyers are going to be piling into the markets and driving the price up. We have no idea if another country, such as China has, will enact harmful laws against bitcoin and other cryptocurrencies, which will drive the price down. There are so many variables at play here many of which have absolutely nothing to do with the code and how well bitcoin actually works. He also claims that everyone that is involved in different blockchain projects is just trying to get rich. He claims that all the other projects out there, Litecoin, Ethereum, Ripple, DogeCoin, etc.… Are just trying to get rich. Just as he tells you with bitcoin, it is also possible to encode future price fluctuations with any other coin. While it may be true that many people involved in the different blockchain projects are just trying to get rich, it definitely is not true that you can encode future price fluctuations. The entire video presentation is based on a lie that is completely untrue. I haven’t actually tested out the system for myself and went through the process, so I cannot show you exactly how you get scammed step-by-step, but I have reviewed enough of these ridiculous trading scams to know how it works. Of course the system is free to use… Because this guy is just so generous and it just so happens that he picked you to be one of the limited number of people to use this incredible system. However, of course you’re going to have to deposit money to get started trading. AND… This is what they scam you. Once you deposit that money good luck getting it back. You will likely never see it again. What happens is the scammers behind this Bitcoin Hack scam will refer you to some broker (usually unregulated) and they will receive commissions based on the deposits that people make. So the Bitcoin Hack scam and the broker working together to scam people out of their hard-earned money. If you have already deposited money with this system and are trying to get it back, there are services such as MyChargeBack that work to help recover scam victim’s money, but there still a good chance that you will never see that money again. While I already said that I have not actually tested out the system and have not been scammed by it myself, there is no doubt in my mind that this is one massive scam. I know it sounds convincing and you may want to believe that everyone has been lying to you, and that you really can get rich this easily off bitcoin, but unfortunately the only person lying to you here is the guy in the video presentation who claims to have invented bitcoin. There are so many lies throughout the video presentation that it is insane. If you still are thinking about getting involved with this, I strongly recommend you do some more research on your own and maybe talk to anyone you know that has a fair amount of knowledge on bitcoin in blockchain technologies. Anyways… I hope you enjoyed my review and found it helpful. Please like and share my post here to help spread the truth so that others can avoid this scam as well. The Britcoin System is supposedly some amazing new “risk-free” trading software that can make you thousands of dollars per day… Or at least that is what they tell you. But is it really? After all… I am sure we have all heard lies like this a thousand times before that turn out to be complete scams. So is this the real deal or is Britcoin System a scam that you should be avoiding like the plague? Unfortunately it is the latter. It would be nice if a system like this really did exist… But it doesn’t, at least not today. In this review I’ll be going over why this is a scam and why you should definitely be avoiding it. I’m sure you are already suspicious of it all and were already thinking it is a scam in the back of your mind. After all, you are taking the time to read my review ever which means you are probably searching around Google or Yahoo for more information before buying into this. And good for you… This is something you should always do when something sounds a little bit too good to be true. But anyways, below I’ll be going over what the system as in some of the claims made, how it works, signs that is a scam, one massive red flag that pretty much proves it to be a scam in my opinion, how they actually scam you and more. The Britcoin System is supposedly a “risk-free software” that can make you thousands of dollars a day, up to $3403 per day, by trading bitcoin and other cryptocurrencies. And of course… It is 100% automated he and you don’t have to do a thing. And let’s not forget the fact that they tell you is beginner friendly, which makes perfect sense since you don’t have to do anything. As soon as you land on the website for this system you are greeted with a video presentation, which I’m guessing probably made you suspicious. It would probably be easier for scammers to scam people if they made the systems seem less great than they do. They make them out to be these incredible fairytale magical trading systems that dump profits into your bank account on autopilot… Which obviously sounds too good to be true. It is also worth noting that Britcoin System is not available in the United States. This may sound like something completely harmless, but is something I often see with these sorts of automated trading scams. The US has much more strict roles when it comes to these sorts of things and often times the scammers behind them do not allow US citizens to access the website because they do not want US authorities involved, which certainly will take down scams like this. Just as expected… This system runs on some special algorithm that can supposedly protect the movements of the cryptocurrency market with 99% accuracy, which is supposedly the trading accuracy of the software. This is what every single automated trading software scam out there tells you. They are always based on some new breakthrough algorithm that can make incredibly accurate predictions. Anyone involved in the cryptocurrency market, or any market for that matter will tell you that 99% accuracy is absolutely ridiculous and impossible to achieve. Not only is a statistic like this ridiculous in any sort of financial market, but cryptocurrency markets are known to be very volatile and make large price swings due to speculation and emotion, making it very hard to predict at times. So this just makes it all the more ridiculous and certainly a major red flag this is a scam. But anyways… Below I’ll be going over some other signs that should be noted which really point to this being a scam even more. Obviously this all sounds just too good to be true. And of course when something sounds too good to be true, it probably is. I mean seriously… Just think about it… 99% accuracy, risk-free, making thousands of dollars per day… This can’t be real. Sounds just like the Banking On Blockchain and Litcoin Trader scams that I’ve exposed. Something that you probably are not aware of is that Britcoin System is actually a copy of some other older scam systems that have come out. This is something you see a lot of times when dealing with scams. Once a scam has run its course, scammed a lot of people and got a lot of negative attention, the scammers will rebrand the scam under a different name and do it all over again. I also found out that it is a copy of the Bitcoin Kiwi System as well. And of course the testimonials that you are shown on the website are completely fake. Below you can see a screenshot I took from the website of three people who have supposedly been using the system and making all kinds of money with it. You can also see a photo of the woman in the center, which is actually a stock photo. Free is great… But it is not realistic. If something is free there is almost always a catch. Sure, there are free trials… But you have to pay for the product/services later. They have to make money somehow and something cannot just be given away for free. So this is a big red flag. But anyways… This system actually is not free at all. As you will see, these people will scam you out of your hard-earned money. One thing you should be in the habit of doing is always looking for a disclaimer when it comes to suspicious opportunities like this. Usually the disclaimer is at the bottom of the website, where most people aren’t going to look. The disclaimer for Britcoin System contains a “high risk investment warning” and they tell you that they are not liable for any losses. They also tell you that you could potentially lose some or even all of your money. Sounds a bit strange doesn’t it? I mean what is the point of even putting a warning like this up there if the system trades with 99% accuracy and is “risk-free”? Telling you that the system is “risk-free”, yet having a “high risk investment warning” in the disclaimer seems to be contradictory… Doesn’t not? Well… Unfortunately this is how scams get away with scamming people. They can tell you all the BS they want to, as long as they have a truthful disclaimer it seems that they are legally allowed to scam you. One major red flag is that this system refers you to a broker to deposit your money for trading. Now why is this a scam? Well… Because when it comes to trading cryptocurrency there is no need for a broker. In fact… I’ve never seen a legitimate cryptocurrency trading software that goes through a broker. Well… I’m sure you already know how they are going to scam you. While the system is free to use, you have to deposit money with the broker and this is how they scam you. Good luck on ever seen that money again. These scams work directly with the brokers that they refer you to and receive commissions… Or at least this is how I think it works. Either way they are definitely scamming you. Britcoin System is a pretty obvious scam and I am sure you are already fairly certain of this before even reading my review. I hope I confirmed your suspicions and help you to avoid this place. Now in the future you know that if something sounds a bit too good to be true, always do some research. That said… Do a fair amount of research because you also come across a good bit of fake reviews when searching around Google and Yahoo… So you have to get your information from multiple sources to really stay safe. When you hear the words “risk-free”, they tell you that it trades with 99% accuracy or even anything close to this, they talk a lot about getting rich and not much about how the system actually works… It is pretty much guaranteed to be a scam. Is Crypto Prophecy a Scam or Great Opportunity? – You Should Read This! 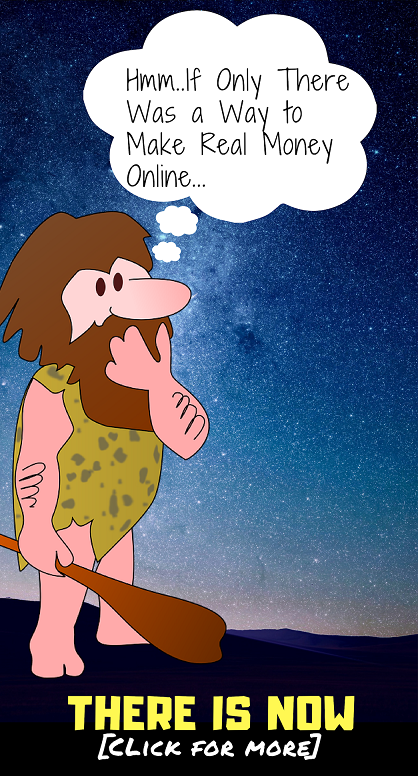 Crypto Prophecy it is supposedly some “Control Panel” system that you can earn massive profits on in the cryptocurrency market. But is what you hear really the truth? Is this system really as amazing as you are told? Or is Crypto Prophecy a scam that you should just avoid? After reviewing this system I would definitely say that the sales video makes it seem much better than it really is. Can you potentially make money with this system? Absolutely. Can you lose money with the system? Absolutely. If you were possibly thinking about buying into this I would take the time to read over my review and hear me out beforehand. While I definitely wouldn’t consider it a scam like Crypto Cash for Beginners or Digital Formula, it just isn’t quite as good as it seems. When you land on the Crypto Prophecy website you are greeted with a video presentation that starts out by telling you that “it’s your lucky day” and that this video isn’t available to the general public. You are led to believe that you are specially invited to watch this video along with some other people for a beta test group. But none of that is true. Crypto Prophecy is available to anyone as far as I know and you haven’t really been specially invited. You probably got an email from someone telling you to try out the system or check out the video which you are probably hesitant to click on in the first place. But anyways… The system was created by a woman named Susie who goes by the name of crypto girl and crypto chick apparently. She tells you that she has some “profit Control Panel” that allows you to get a piece of the $360 billion market cap, and it is the cryptocurrency market that she is referring to. She goes on to tell you that she is selling this system because it is a partnership that both her and you benefit from, but even after completing my review, I fail to see how this is a partnership in any way. If you buy into Crypto Prophecy you will get some video tutorials for buying/selling cryptocurrency along with the control panel that she tells you about, which shows you what to buy or sell and when to buy or sell it. In addition, if you pay more, you can get personal trade recommendations from her. There also live webinars on Wednesdays in which you can ask questions and get answers. As mentioned, she goes by the name of “crypto girl”, at least on Facebook. She is fairly popular on Facebook and has around a thousand followers. The reason people follow her is for investment advice on cryptocurrencies. So yes, she is a real person and she does at least know some of what she is talking about, but is this product really worth purchasing? Well… There are a few red flags that I will go over what you should be aware of. First off… The video presentation is misleading at times. In the video presentation she shows you a bunch of charts of cryptocurrencies that have skyrocketed in price. However, she does not show you the full picture. 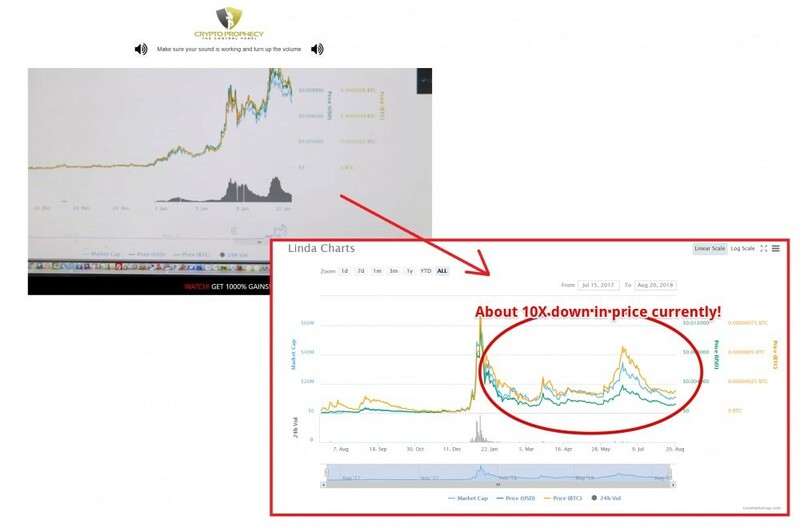 For example, she showed a screenshot a price chart for the Linda coin but only showed it up to its peak. She did not show the downtrend that followed, which you can see below is 10 times lower. There do seem to be a lot of people who of made money from following her advice, but these examples are coming from, what I can tell, the end of 2017 and early 2018 when you could make money on pretty much any cryptocurrency investment you made. The entire cryptocurrency market was booming and you could pretty much throw your money in anything and get a profit. While you could have turned $10 into over $4000 (as she tells you), there haven’t been opportunities like this in a long time… Very very few if any. The example shown in the video presentation are old and come from when the big boom was going on. This was basically a bubble at the end of 2017 and early 2018 that popped and still has not even come close to recovering. You can see from the screenshot I took below, at the peak of the cryptocurrency boom the market evaluation was that $831 billion and currently, as I am writing this, it is at $214 billion… That is around 1/4 what it was and there still are not really any good signs of it recovering. Something else I notice is that she keeps mentioning that you can get a piece of the “$360 billion pie”. I’m not sure if the video presentation was filmed they while ago and is old, but the cryptocurrency market is not valued anywhere near $360 billion currently. One thing that really bugged me in the video presentation is that she keeps showing how she sold bitcoin for all this money using Coinbase, which is probably the most popular cryptocurrency exchange out there. The reason this bugs me is because Coinbase is an absolutely horrible exchange to use when trading cryptocurrencies. This is NOT what you want to use unless you love getting charged high fees and paying a bunch of money that you don’t need to pay. You could easily use other exchanges, such as CoinbasePro or Gemini, and not even pay close to the amount of fees as you would when using regular old Coinbase. So I’m not sure what the deal is here. Why is she using Coinbase? Does she not know that there are better exchanges out there? Or maybe is she just using Coinbase so that she can get referral bonuses when she refers other people to join Coinbase (they give $10 referral bonuses)? I don’t know what the deal is but I don’t like it. Does Her Control Panel Really Work That Great? This “Control Panel” is said to tell you exactly when to buy and when to sell for massive profits. She says that it is so good and the timing is always perfect…. That is like winning the lottery, which I am very hesitant to believe. Supposedly it runs a feed of current market information and picks the best trade opportunities… Doing all the research for you. However, based on what I have found,. Of course you want to buy low and sell high, so the coins that have dropped in price are listed in green on the control panel as good coins to purchase. This is all it does as far as I know. Anyone reading this can correct me if I am wrong, but as far as I see this does not look like anything special by any means. In fact, it seems pretty crappy. It does not take into account what the coin actually does, whether or not it has been pumped, whether it has a realistic future, the team behind the project, etc. There was a YouTube video that I watched from a guy who purchased Crypto Prophecy and I took a screenshot of what the control panel was telling him to do. As you can see, the coin “Dropil” it is listed in green. This green indicates that this is a coin you should buy. The ones in red are coins that have already went up in price and that you do not want to purchase. So what to do now??? I guess now is just a waiting game and I guess you have to pray that this coin does not go down any further, which it very well could do. She makes it very clear that this system does all of the research and hard work for you, but I always recommend you do some research on your own. I definitely wouldn’t recommend purchasing a coin based on what this Control Panel tells you since it seems to really not take all that much into consideration. This system seems to only be relying on whether or not the price has went up or down in order to make a call on whether to buy/sell. This strategy could have been very profitable during the cryptocurrency boom that I talked about above, but not so much anymore. Plenty of cryptocurrencies have went under in pretty much vanished from the face of the earth. There have been times of people that have lost tons of money in the cryptocurrency market and this is not the incredible opportunity it was back in late 2017. I have been trading cryptocurrencies for about eight months now and to be honest the market is pretty crappy right now. I still have hopes that it will bounce back, but only time will tell. I’m sure that crypto girl (Susie) has made a lot of money in cryptocurrencies, as she says she has, but pretty much everyone has who got involved early on. Just because you made a lot of money in cryptocurrencies definitely does not mean you know what you are talking about. There are plenty of idiots on YouTube that share investment advice and really have no clue what they’re talking about… They just got lucky. Now I’m definitely not saying that she has no clue what she is talking about, but I will say that a lot of her investments or ones that I would not have made myself and ones that I do not consider very good. I would love to see her performance over the last several months… Besides that of the crypto boom because everyone made money back then. If she is still making incredibly accurate and profitable trades in the current market state, then this would be impressive. But I see no proof that she is. So anyways… You can bind to this product if you want to, but it is not something that I am going to be recommending, nor will I be purchasing it myself. It just doesn’t seem all that great and the trade recommendations that it makes seem to be pretty horrible to me… Which means you will lose money. 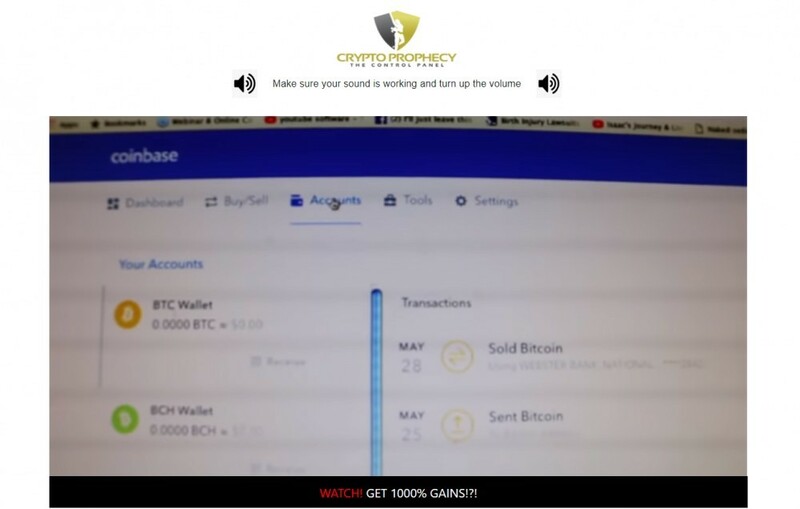 Crypto Cash For Beginners Scam – Don’t Expect to Get Rich! Crypto Cash For Beginners is some new opportunity being promoted online to make easy money trading cryptocurrencies. But is this really as great as it seems? The answer is NO it is not. 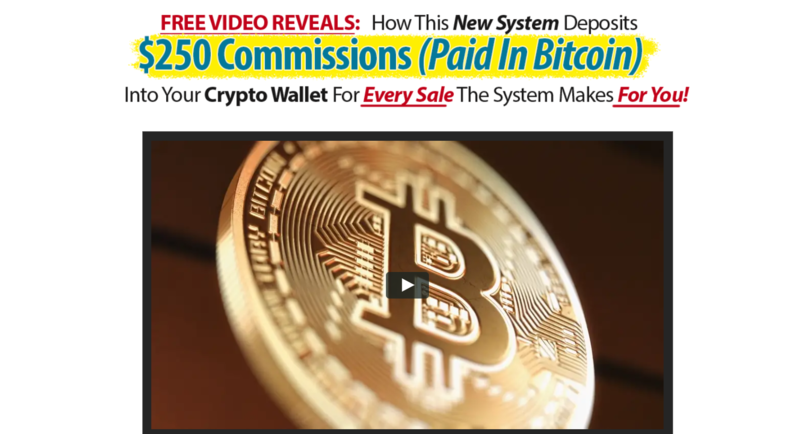 In short, Yes this is a scam… A very misleading one that lures people in by talking about all the super easy money they can be making in no time. In this review I’ll be exposing this place for what it really is. While it is possible to actually make money with Crypto Cash For Beginners you should not expect to make much. The income claims are massively over exaggerated and if you buy into this you really are provided all that much value. 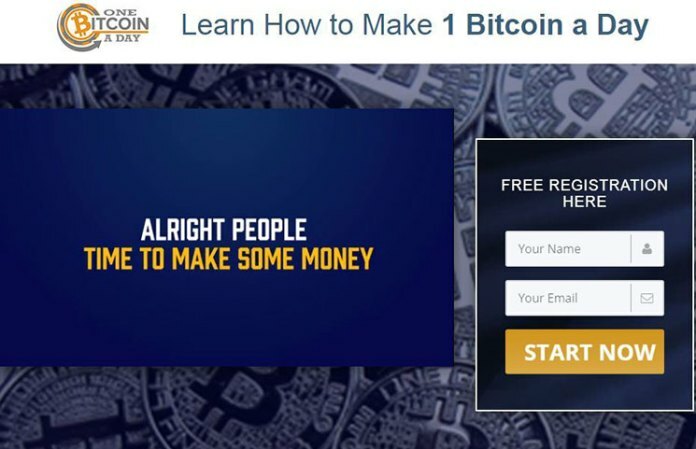 Crypto Cash For Beginners is supposedly based around some “money making secret” that anyone can make thousands of dollars with in no time at all. In fact, the spokesperson, who is “Edward Clark” claims to have made over $1 million trading cryptocurrency in the last 10 months. He even shows a screenshot of one of his trading accounts, but of course we all know that pictures like this can easily be photoshopped. But anyways… He claims that trading cryptocurrencies it is super easy as long as you know how to do it. And of course the powerful method that Crypto Cash For Beginners uses is “essential for trading success”. All you have to do is make the trades that Crypto Cash For Beginners tells you to make and WALLLAAAHHHH…. BOOM… Fast profits!! Or at least that is what he lead you to believe. However… As you will see throughout the rest of this review, much of what he tells you is a complete lie and/or very misleading. I will go over some of the lies and then after that I’ll go over what you really get when you buy into Crypto Cash For Beginners for $37. By the way: Also avoid Crypto Cash System and Crypto Coin Sniper. They are both similar scams. I’m sure I wasn’t the only one thinking that the testimonial videos were fake. You know… The two videos, one of a woman in the other of a guy claiming to be making thousands of dollars per day with this super easy system. Full disclosure: I don’t have any full-on proof that these testimonials were fake, but I think anyone with some decent judgment would agree with me here. The guy behind it all, “Edward Clark”, is also likely a fake. Why do I say this? Well… Because I review scams like this all the time and the real scammers behind them usually create fictitious characters to promote the scams under. Of course the real people behind it do not want their names to be known because they will likely face backlash from upset buyers. What you may not have noticed from the video presentation is that “Edward Clark” gives no verifiable information about himself. He just gives you some typical background story about struggling to make money and then coming across this amazing system. There is no information that I can do research on to verify that this guy really is who he says he is. So pretty much you just have to trust what he is saying or choose not to trust it. I choose not to trust it. There are many things in the video presentation that really don’t make any sense. To someone who is new to cryptocurrency trading it may seem all legitimate, but I have been involved with cryptocurrency trading for well over six months now and there are a few things I picked up on that really just don’t make sense. As you can see he is showing you a screenshot from the dashboard of “Cryptohopper”. The reason this doesn’t make any sense is because Cryptohopper is a cryptocurrency trading bot software which has nothing to do with Crypto Cash For Beginners. The software runs on its own and makes its own trades based on how you configure it. It just doesn’t make any sense for him to show you a screenshot of this account when it has nothing to do with Crypto Cash For Beginners. Edward Clark claims that he learned the method his system uses from someone who got started trading back before anyone even knew about Bitcoin. He says that he earned a lot of money back then but this makes absolutely no sense. In order for trading to be profitable that need to be plenty of buyers and sellers. Sure, investing early on would have been very profitable, but trading early on would not have been at all. There just weren’t people really trading bitcoin way back then. When you buy Crypto Cash For Beginners you will get a beginners trading guide that provides very general information on trading cryptocurrencies. This includes guidance on setting up crypto exchange accounts, funding the accounts, and actually placing trades. It is all very basic and can easily be found for free online. In fact… It would be easier to just go on YouTube and watch some videos. In addition to the basic trading information, you also get alerted several times per week via email about trades to make. This is the main part of Crypto Cash For Beginners. Placing trades on exchanges is easy… Anyone can do this. It is knowing what trades to place that is the hard part. You can lose money trading cryptocurrency just as easy as you can make money and if you do not know what trades to make then it is not something you should be getting into. So that is great that Crypto Cash For Beginners tells you exactly what trades to make and when to make them… But should you really trust this place? After all… The video presentation is full of misleading information and blatant lies. Trading cryptocurrencies is much easier said than done… Or I guess I should say “profitably” trading cryptocurrencies is easier said than done. The bottom line here is that I do not trust this place. Why should I trust information from some guy named Edward Clark that probably doesn’t even exist? Also, you should know that trading systems like this are doomed from the start. When it comes to trading that are buyers and sellers. When you buy cryptocurrency you are buying it from a seller and when you sell cryptocurrency you are selling it to a buyer. Systems like this, that are set up so that everyone makes the same trade, are doomed. In most cases you don’t want everyone making the same trade as you. If you are buying, you want people to be selling so that the trade can even happen in the first place. Now this Crypto Cash For Beginners likely isn’t going to become a very popular system/method/program or whatever you want to call it, but I’m just saying that in theory these sorts of systems can’t work out if they get too big and become too widely used. Trading cryptocurrency can be extremely profitable if you know what you’re doing. The problem is that most people don’t know what they are doing and I am willing to bet that the majority of people that get involved in trading cryptocurrency lose money. As I have mentioned, I have been trading for well over six months now and I have been profitable. There are times when I don’t fear all that well, but overall I am enjoying it and will continue to trade. So based on my own experience I would say if you are interested in trading cryptocurrency then go for it. I don’t have any “beginners guide” to sell you or anything like that. The best advice I could give if you are interested in getting started is to just do a bunch of research on your own. YouTube is what really helped me get going and I learned a lot from many different videos. That said… A lot of YouTube videos will steer you down the wrong path. So you have to be careful. Buy into Crypto Cash For Beginners if you want to but I really don’t see any point in buying into it. All it really provides you with are two things: a very basic guide to making trades on exchanges and email alerts on when to buy/sell. The basic information given in the guide can easily be found all over the place online, so that is really not worth any money. In the email alerts telling you want to buy or sell or something that I definitely do not trust. On a completely unrelated note, if you are just looking for a way to make money online and are a newbie to the world of making money online, I would suggest taking a look at my “make money online guide”. Again, this has nothing to do with cryptocurrency trading but may be something that you are interested in. One Bitcoin A Day claims to be some incredible automated system where you can profit one whole bitcoin every day. But is this really true? Or is this just another scam that is going to leave you with less money than when you started? Unfortunately this is just another one of those scams. You will not make any money with this system. It is completely fake and is designed purely for scam purposes. In this review I will be going over why it is a scam and why you need to avoid it. By reading this review you will also be able to learn what to look for in the future so you can avoid other scams that may come your way. One Bitcoin A Day claims to be in automated trading software that anyone can use to profit one bitcoin per day. However this is fake. The creator of this incredible software goes by the name of Justin Hagan . However this is also fake. Everything about this scam program/system is fake as can be and you will see why. First off it is free to use. Anything that claims to be 100% free you should always be suspicious of. Sure there are some things that are provided for free but normally they are free trials or something along this line, where you will have to pay money in the future. However this claims to be completely free… Forever. So how the heck did they pay to keep this trading software up-to-date? There has to be a team behind this keeping everything running smoothly so this really makes no sense. One bitcoin per day???!! Are you kidding me? That is a heck of a lot of profit and really doesn’t make much sense because you only have to deposit $250 to get started. So just think about that for a second. As I’m writing this bitcoin is around $10,000 so for you to be able to make one whole bitcoin per day by depositing just $250 this means you would be making 4000% gains every single day. Of course the system requires no work on your part. All you do is deposit money and it starts cranking out the profits. People always seem to think that it is super easy to make money online when the reality is that making money online requires real work just like any other job. Any system that claims to be super easy is something that you should either avoid or proceed with extreme caution when looking into. The guy that is supposedly behind this incredible trading software is named Justin Hagan, however there is no proof that this guy even exists. He is likely just a paid actor that the scammers have paid to help promote the scam. This is not unusual at all to see when it comes to automated trading scam such as this one. I review scams like this all the time and many of the suppose it creators are easily exposed as fakes. This whole entire scheme also doesn’t even really make much sense. The name is “One Bitcoin A Day” yet they talk about how this system trades in the Forex and binary options markets. So then why the heck would bitcoin be in the name if it has nothing to do with bitcoin or cryptocurrency? Bitcoin is completely different from Forex and binary options so this is just something that really makes no sense to me. If anyone could explain this I would appreciate it but I’m guessing that it is just something that is unexplainable. Of course they refer you to in unregulated broker to deposit your money. Whenever you come across systems like this they always refer you to some broker in the scams always refer it to in unregulated broker that is pretty much out of the laws reach. Always look into the broker before you deposit money. There are a heck of a lot more scams out there than legitimate trading software so you have to really be careful what you get involved with. As I said, there are plenty more very similar scams out there, Bitcoin Focus Group, Trident Crypto Fund, and Bitcoin Bonanza just to name a few. I review scams like this pretty darn often and they are usually very similar in the way they operate. Just as this one does, they lure people in with the hopes and dreams of making super easy money online. They claim to be completely automated, required no work, and the anything you pretty much have to do is deposit money to get started. These trading systems scams usually claim to operate under some new breakthrough algorithm that can somehow accurately predict the market like no others before it can, but it is all just a bunch of BS. Whenever I look into potential scams like this I always go in with the mindset thinking that they are already scams and look to be proven wrong. Unfortunately with this one there is nothing that proves otherwise. Everything that I see just points more and more to it being a scam. Not much to see here… Just your pretty typical get-rich-quick scheme. Luckily for you, you did not get pulled into it. You took the time to do a little extra research and came across my review before making a big mistake.… Or at least I hope this is what happened. If you did already buy in then don’t feel too bad, many people get scammed by these types of fake systems and is nothing to feel terrible or stupid about. You live and you learn. You can learn more about how to avoid scams like this in a post I wrote here about signs of cryptocurrency scams. Trident Crypto Fund claims to provide a crypto index fund that pays out daily profits. Everything that they tell you sounds great but the question is whether or not they are telling you the truth. It is this place the real deal or is Trident Crypto Fund a scam that you need to avoid? I have reviewed many similar cryptocurrency Ponzi schemes like this before so this question is not ridiculous by any means. 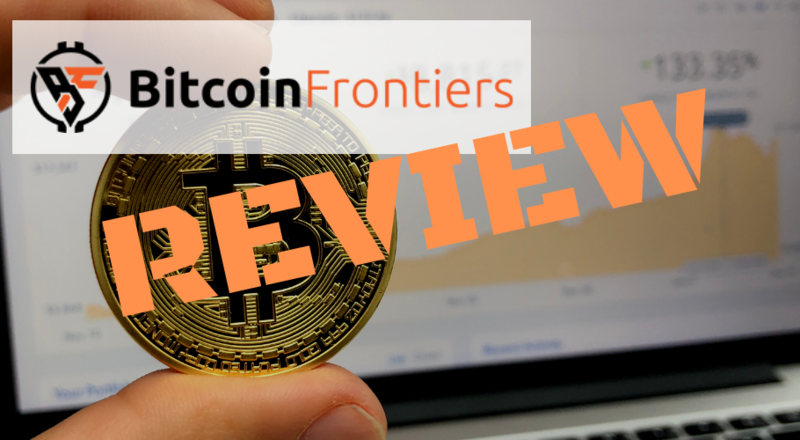 In this review I will be going over how this cryptocurrency fund works and some serious concerns that I have about it. If you are thinking about possibly investing in this you are going to want to read this first. So what is Trident Crypto Fund? Well as I said it is a “crypto index fund”. What they claim to do is invest in the top 10 cryptocurrencies on the market. This sort of index investment strategy generally works out well and provides more balanced and last volatile returns because your funds will be distributed among the 10 biggest cryptocurrencies out there. They determine which are the top 10 based on the market cap. It is nice to see that they do not claim to provide that crazy of returns on your investment, however I am still concerned of the legitimacy of this place. They do have a referral program and there are other reasons that I believe this could possibly be another Ponzi scheme like Kryptogenex, Supreme Coin & Bits Trades. When you invest you have three different packages to choose from. The minimum investment that you have to make is $100 and the maximum you can make is $100,000. The more you invest the higher ROI you will receive on a daily basis. Each investment package expires at 140%, meaning that with each package you will receive 40% profit on your investment. The difference between the packages is that the more you invest the higher returns they will produce on a daily basis in the faster you will get to that 140%. 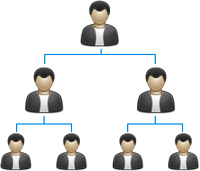 Having a referral program by no means proves that this is a Ponzi scheme in any way, however the depth of this referral program is concerning. You will be able to receive direct referral bonuses and residual commissions from the binary compensation plan. The direct referral bonuses will be paid out in both real money and in TDC points, which are points that have no value outside of Trident Crypto Fund just to let you know. You will receive 5 to 7% in real money from direct referral bonuses and a 15 to 21% in TDC points. The amount you receive depends on what package you have personally purchased. The more you have invested the more you will earn. This binary structure goes on and on and on. There is no limit to how deep it can go. It will just continue to branch out as more people are recruited in. When you recruit to people when they will first fill up the two positions beneath you and then they will spill over into any available positions in your downline. People in your downline will also be recruiting people and that will be filling out positions. So obviously Trident Crypto Fund has a very lucrative referral program. What concerns me about this is the binary compensation structure, which is very common with Ponzi schemes, especially one that goes unlimited depth like this. Of course, as I said, this does not mean it is a Ponzi scheme… But it is concerning and does raise my suspicion. And this is not the only thing that raises my suspicion. I have several other reasons that I suspect this to be a Ponzi scheme as I will go over below. They claim to provide a fixed returns, as I showed you above. The amount you will receive with daily return depends on the amount you invested, but the fact that they are fixed is very concerning. How can they possibly promise to provide investors with fixed returns in such a volatile environment? Sure… It’s true that cryptocurrency investments have been some of the most profitable in history and even I am invested heavily in cryptocurrency, but this does not mean that fixed returns can be provided. After all I have no idea how they would possibly be providing fixed positive returns at times such as the massive market crash we saw in early 2018. All of the top 10 cryptocurrencies had some massive crashes, and the entire market as a whole, so how can they possibly provide the same returns? It just makes no sense. 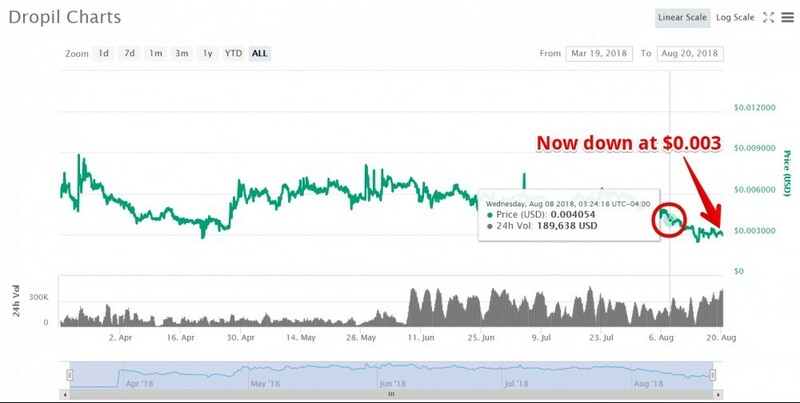 Below is a chart you can see of the massive crash that I am talking about (courtesy of CoinMarketCap). And of course there is absolutely no information about the team behind this. We know absolutely nothing about the people that are managing the money you invest. Do they have a history of professional investing? Have they been involved in cryptocurrency investing for a while? What are their backgrounds?…… We know nothing at all. So I guess you just have to take them at their word and trust them if you are going to invest in this. Personally I will never do this because there are many more cryptocurrency related investment scams out there than legitimate opportunities it seems. They claim to have been around for two years in which they have rigorously tested out different investment strategies to provide you with the best for this cryptocurrency index fund. However, they provide absolutely no proof of this. As I am writing this that they are website is only a few months old and there is no proof that they have been around for more time than this. Once again this is a claim that you are just going to have to take at their word and trust them, which I’m not willing to do. Many of the red flags I see with this investment opportunity are things I have mentioned in my post on spotting a cryptocurrency scam. Conclusion on Trident Crypto Fund – Scam? Of course this is all my opinion but based on what I see this seems to be a scam. Why? Well because there is not much of a reason to trust this place. Sure they have a very nice website and say a law of the right things, but there is no proof that they are actually doing what they say they are doing. This could easily be a Ponzi scheme where they are just taking incoming investments and paying older investors from those new investments. Can you make money if it’s a Ponzi scheme? Well of course you can… Ponzi schemes do pay money and some people get very rich in them, but they are definitely not worth it. Statistically speaking, the majority of people involved in Ponzi schemes end up losing money and the problem is you never know when one will collapse, which is guaranteed to happen because they are completely unsustainable. So would I invest in this place? Absolutely not and I do not recommend anyone else do it either. But of course it is your money and you can do with it what you want. Kryptogenex claims to be in amazing cryptocurrency education platform that also provides an amazing business opportunity where you can make boatloads of money referring others to join, but is this really a place you should be joining? Or is Kryptogenex a nasty scam that you need to avoid at all costs? In this review you will see that I have some serious concerns about this place. There are many red flags that I have found that telling me to avoid it and that it is a scam. In this review I will be going over what Kryptogenex claims to be as well as my concerns. If you are thinking about buying into this you’re going to want to think again and definitely read this over first. Kryptogenex is marketed as an education platform that provides basic education on Bitcoin and cryptocurrency in general. On top of this they also provide investment opportunities where you can invest your bitcoin with them and have them manage it. Everything sounds good so far but then when you see the lucrative compensation plan that they have in place, where you can get paid to recruit and other members, it starts to get a bit concerning. There is nothing wrong with a company paying members to refer and other members but when it comes to platforms like this that offer cryptocurrency investment package is, this is definitely concerning and it makes me wonder if it is a Ponzi scheme like the many other crypto Ponzi’s out there. For example: Bits Trades and Supreme Coin. Another major concern that I’ll go over is about the people who created this place. The main product that they promote this place with is the education platform. Like I said, you are provided with very basic cryptocurrency education. This will include information on things such as: what is Bitcoin, the basics of blockchain technology, where Bitcoin came from, how to trade cryptocurrency, etc. It is all very basic. For example the information provided on trading cryptocurrency will only tell you how you can go about doing it but as far as strategy goes you won’t know anything. The training is laid out video format which is nice and easy to follow. If you want to buy into Kryptogenex you will have to pay for this training. This is the “core product” and cost $250 plus $50 per year if you want to be a promoter and earn money recruiting others to join. They also have what is called The Krypto App which is for people who want to invest a small amount of Bitcoin, $50 – $200. I don’t know much at all about this because they do not really tell you anything. All they tell you is that this is for people “looking to get their feet wet” but not invest a lot. This seems to be where they are trying to funnel everyone. 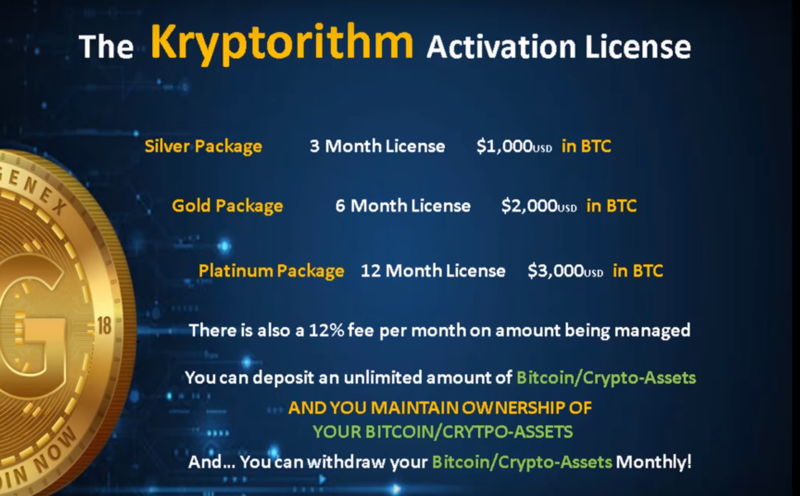 As a member you will get access to “The Kryptorithm” which is supposedly a “very powerful algorithm” that manages your crypto assets for you. You get access to this but you will have to pay more money to actually buy into it. While supposedly it is a bitcoin management service where you can deposit your bitcoin with them and they will manage it and help grow your wealth. There are three different packages you can buy in at: the Silver Package, the Gold Package, and the Platinum Package. The silver package cost $1000, the gold package cost $2000, and the platinum package cost $3000. You do not have to join as a promoter but this seems to be what most people are going to do. Why? Well because the compensation plan is very lucrative and the education platform is very basic with information that can easily be found for free online… So I don’t really know why anyone would buy in just as a customer. When you recruit someone to join in you will get paid $100 right away when they buy in at $250. This is when they buy the main course, or the educational package. The real money comes in when you recruit someone and they buy into The Kryptorithm. You will be able to earn $400-$1200 based on which package they purchase. You will also be able to earn $25 bonuses when you recruit someone in and they join as a customer only. This is nice because it shows that they are trying (to some extent) to sell this as a product to the general public and not to people who are just looking to earn money recruiting others in, but as I said I do not think many people are going to be joining just as customers. You will also be able to earn a $250 bonus when you bring in 10 customers. What they all The Kryptonary is their binary compensation plan. In order to make money from this you first have to recruit in two members. There are two open spots below each person and it branches out the further down it goes. If you recruit in more than two people the additional recruits will spill over and fill in any positions that are open beneath you. You will be earning commissions from many levels beneath you with this Kryptonary payout plan. This is that the pyramid part of the compensation plan because commissions will flow up from your downline to you. One of the big problems that I have with this place is that there is no information on the people behind it. They do not tell you anything about the founders/creators and your left completely in the dark. Buying into the education platform for $250 isn’t all that crazy, but investing thousands of dollars in The Kryptorithm investment packages??? That is crazy to do that without even knowing anything about the people behind it. But anyways… after doing some digging around I found that one of the co-founders of this place is a guy named Stephen McCullough. And what you need to know about him is that he was one of the co-founders of SkyBiz. What is SkyBiz? Well…. lets just say that it was sued in 2001 by the FTC for being a pyramid scheme and leave it at that. So literally all I know about the people behind this place is that one of the co-founders has a history of pyramid scheming. Great news right? It is hard to tell what is really going on here. With online platforms like this you never really know what is going on in the background. Are they running a pyramid scheme? A Ponzi scheme? You have no idea. For all I know they might not even be investing your money when you buy into The Kryptorithm with thousands of dollars. And because of how shady and nontransparent this platform is I am very suspicious of this possibly being true. This place exhibits many of the characteristics I warned about in my post on spotting a cryptocurrency scam. They could just be using incoming investments to pay off older investors. But anyway, this is all just my opinion. I personally do not trust this place and I see no reason to buy into it if you are looking for cryptocurrency education alone. You can easily find plenty of free cryptocurrency educational videos on YouTube that make it very easy to understand. 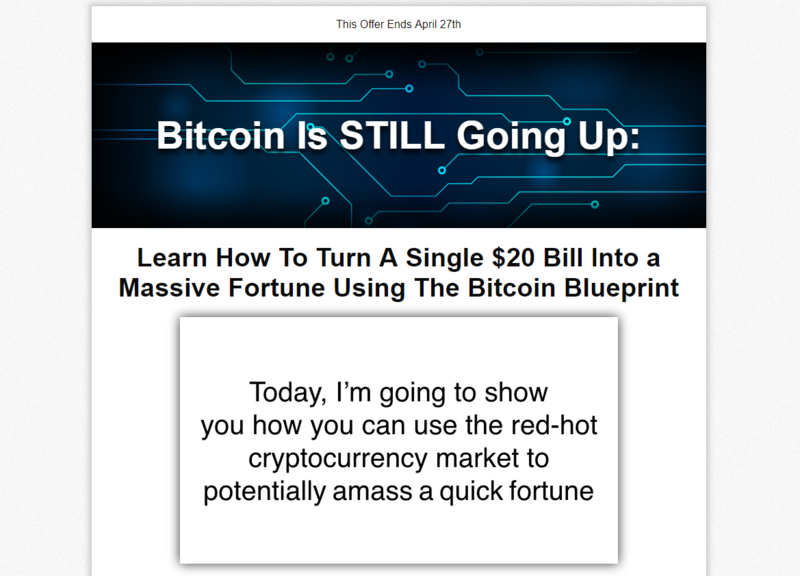 The “$20 Bitcoin Blueprint”, aka the “Secret Bitcoin Blueprint” claims to be able to make you rich in the cryptocurrency market. There is a lot of hype surrounding this product and it is being advertised all over the Internet, I actually came across it after clicking on some ridiculous add that I was curious what it would be to. Anyway, since you are reading this I’m guessing that you listened to some ridiculous sales pitch about why you need to buy into this and are suspicious of whether or not it is legitimate. Is $20 Bitcoin Blueprint a scam? Is it legit? Will it make you rich? Or is this just going to be a waste of your time and money? In this sales pitch the guy kept referring to some “secret bitcoin blueprint”, “secret $20 bitcoin blueprint”, and a few other similar names but as you probably already know this was all just a sales funnel to get people to buy into another product. As you can see right off the bat they tell you that you can somehow earn a $20 bill into a “massive fortune”. The spokesperson claims that he is going to show you how to use the “red-hot cryptocurrency market to potentially amass a quick fortune”… which makes me think of the Altucher Report product that is being promoted all around. Anyway… the whole sales pitch hinges on the idea that Amazon.com, the world’s largest retailer, “could” start to accept cryptocurrencies as early as April 27. This is very misleading and not backed up by any evidence. I am active in the cryptocurrency market and keep up-to-date on things, so I have heard talk about Amazon possibly getting involved in more ways than one, but there is no proof that anything special is going to happen on April 27 as the spokesman says. If something were to happen, I agree with him, the prices of many different cryptocurrencies would increase. There is no doubt about that. If the public sees the biggest retailer in the world hop on board and many are sure to follow, which will drive the price up. But how do you get in on this “red-hot cryptocurrency market opportunity”? Well of course all you have to do is follow this blueprint that the spokesman is going to give you which you will be able to get so rich off of that you will have the ability to retire in less than a year… Which is what he tells you. And of course you don’t need to know anything or have any experience. He makes it sound so easy that a caveman can do it. Later in the ridiculous sales pitch he gives a bunch of really bad examples of cryptocurrencies exploding in price. He gives over all sorts of examples of massive increases in prices and talks about how you could have become rich had you invested. At the peak of the sales pitch he plays out a scenario of how you could have turned $20 into $1.64 million in just two days. But the example is absolutely horrible but most people watching this probably aren’t aware of it. The example was this: First you could have invested in a little-known cryptocurrency called AMIS that was trading at $1.54 when the “markets opened up on Monday” and rose in price to $458.82 by the end of the day. Then he goes on to talk about how you could have invested that profit in another cryptocurrency, followed by another cryptocurrency to end up with $1.64 million in just three days. The problem with this example is that AMIS was an awful cryptocurrency that has already died off. It was never any good and never became much. It did skyrocket in price at one point, but that was followed by a decrease in price just as fast. If you would have AMIS today it was worthless. So for one, that is a horrible example, and two, I question if this spokesperson has any idea what he is even talking about. As I mentioned above he talks about the markets opening up on Monday as if they were the stock markets. Anyone who has a little bit of knowledge about the cryptocurrency market knows that it is always open, 24/7. It does not open and close. This is how it is a worldwide and how it has always been. Something else that the guy kept talking about which was very misleading was these “penny cryptocurrencies”. He acts like they are so great because they are so cheap, but the price of one unit of a certain type of cryptocurrency does not mean anything without looking at the total supply. For example bitcoin’s total supply is 21 million. If you had to cryptocurrencies, both of them priced at $0.50, but the one had a supply of 10 million and the other had a supply of 10 billion, the one with the lesser supply would have much more potential to increase in price because the amount of coins would be more scarce. I have seen sales pitches like this plenty of times before and I can take a good guess at what is going to happen. You see that April 27 deadline is nothing more than a way to make this seem more urgent and to get people to buy in as soon as possible… buy the product that they are promoting of course. When this date comes and passes they are just going to put a different date up in the near future. A Look at $20 Bitcoin Blueprint – What Is It and What Does It Include? All This “$20 Bitcoin Blueprint” really is, is just a misleading sales pitch to get you to buy into another product, which as I am writing this is called Seven Figure Formula. This is a penny stock investment newsletter created by Greg Geunthner. But I have seen other reviews of this claiming that it promotes different newsletters so I think they are switching things up. They are using the same “$20 Bitcoin Blueprint” sales pitch to promote multiple things. But anyway…the whole cryptocurrency sales pitch was a bunch of BS. The “$20 bitcoin blueprint” is just a bonus in the newsletter, but not the focus of it. In the newsletter you get 12 months of information for $49. This includes updates on stocks, market news, trade alerts, and other things related. And of course with the bonus you basically get the same stuff in the realm of cryptocurrency. Should You Buy a Subscription to Make It Rich? I don’t know, do you really want to buy into this after that extremely misleading sales pitch? I know that is enough to totally turned me away from this and not even think about buying in, but the choice is ultimately up to you. I wasn’t able to really find any legitimate reviews from buyers of this newsletter. All I was able to find were other reviews that were fake and created just to promote the newsletter earn money doing so. Something else you should know is that this newsletter is published by Agora Financial, which receives plenty of complaints and is well known for publishing newsletters that are promoted under very misleading sales pitches such as this one and two others that I have reviewed: “Freedom Checks” and Real Wealth Strategist. 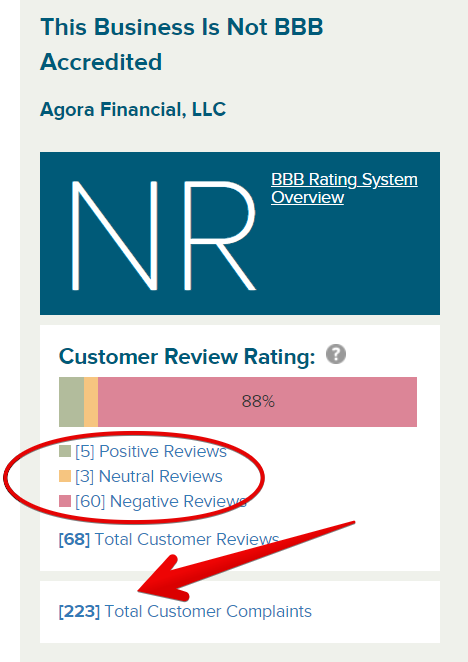 They are not rated by the Better Business Bureau themselves, nor are they accredited, but just take a look at all of the negative reviews and customer complaints. I have looked into this company on other occasions and from what I have found most of the complaints are from people that feel they have been suckered into buying a product without knowing what they were really getting into, and another popular complaint comes from people that have been overcharged and have trouble getting the money back. A very misleading sales pitch no doubt, but can you make money? I’m sure you can but there are a lot of things out there you can make money with and a product that claims to make it super easy for you to become rich in the cryptocurrency market is not something I am going to buy into. The bottom line is that it is not super easy to get rich in the cryptocurrency market. Yes there are tons of opportunities in this market and a lot of people getting very rich, but it’s not easy… What is even easier is to lose money in this market. Ryna Holdings Review – Scam or Good Investment Opportunity? Ryna Holdings claims to be a great investment opportunity that you can make a lot of money with. But is this place really that great? Or is Ryna Holdings a scam that is just going to leave you with less money than when you started? In this review I will be going over what Ryna Holdings is, what they provide, some major concerns I have about what they are doing and more. Ryna Holdings comes off very “salesy” which made me suspicious right away. The one promo video I watch was basically them just showing fancy sports cars and telling me that I could become rich. While I would love to have this life I don’t like opportunities that promote themselves like this. But anyways… what is Ryna Holdings? They are an investment service where you can buy different investment packages and make money off of their investments. Basically what you are doing is investing in them and they are investing in crpytocurrencies, stocks, FOREX, and they are also trading in these markets. They claim to be a great way to make money and claim to be made up by a team of very experienced professionals but I have some concerns about this. In addition to the investment packages they provide you can also make money by recruiting in others to invest in the company. This is why you might see a lot of people promoting this place. Each package lasts for 1 year. In the FAQ section of their website they tell you that they deal with cryptocurrencies, stocks and FOREX but when you look at these investment packages they make no mention of stocks or FOREX. They only mention cryptocurrenies so I don’t really know what’s the deal with this. They claim these packages will provide a certain amount of ROI daily. The more you invest the more you earn. I’m very suspicious of this because I both invest and trade cryptocurrencies myself and I know how volatile the market is. I don’t understand how they can promise certain returns like this. Another way to earn money is by recruiting in other investors. They have a compensation plan that has 9 different ranks and 9 different levels. When you start out at the first rank of Shareholder you will only have access to 2 levels of the compensation structure. But as you move up the ranks you will be able to unlock more levels until you eventually unlock them all. You will be able to earn commissions from each member’s investment in your downline based on the percentages below. 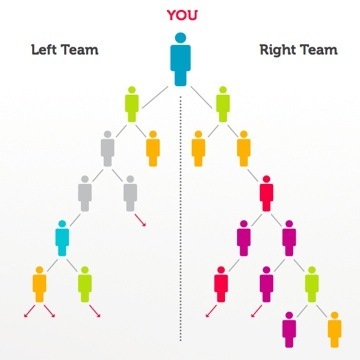 If you are unfamiliar with how mlm’s work basically what they do is allow you to earn income from the people you recruit in, from the people that they recruit in, and so on. They often have a bad reputation because they create a very uneven income distribution where those at the top make the majority of the money. My concerns are that this investment opportunity might not be legit. Why am I worried about this? Well because they have a very lucrative mlm structure which does mean its a scam or anything but is something that makes me suspicious… and they don’t really tell you much of anything about them. Who is the team behind this? We don’t know. They claim that their team is “made up of highly experienced securities and trading professionals” but I don’t see any proof of this actually being the case. All this is to me are words that are not backed up. The also don’t offer any information about what they actually do. They tell you that they invest and trade in cryptocurrency as well as Forex and stocks but don’t give you any proof of this. They have absolutely no track-record and no way to verify any of it. It would be nice if they would give a little detail about things before wanting people to throw their money at them. This seems like it could easily be a Ponzi scheme to me. In a Ponzi there is no real value provided and the new incoming investments are distributed to older investors. Ponzi schemes are illegal in many parts of the world because when the money stops flowing in they collapse and the majority of the people involved lose money. Only those that got in early and are at the top stand any chance of gaining. The reason I think it could be a ponzi is because it has many characteristics of other ponzi’s that I’ve reviewed like Bitty Cash, Resonance Capital, Invia World, etc. It has different investment packages and really pushes investors to go out and recruit other investors in. But of course its not going to say that its a ponzi if it is. Conclusion on Ryna Holdings – Good Opportunity? I definitely don’t have enough proof that this is a scam but at the same time I don’t have enough proof that it is a good opportunity. Their lack of transparency and overall lack of information is worrisome and because of this it is impossible to do a good in-depth review of this place. There just isn’t enough to go off of. And the fact that there is barely anything to go off of is what is so concerning. Well that and the fact that they push people to recruit others in with their 9 level mlm structure. Ryna Holdings could potentially be legit but I think there is a much higher possibility that they are not. It is very likely that this is just another ponzi that is doomed. Because of what I see I will not be investing that is for sure. However, you can do what you want to. I don’t advise it but if you do invest just make sure not to put in any more money than you can afford to lose. Stay safe. Leave any questions or comments you have below and I’ll get back to you soon 🙂 Also you might be interested in taking a look at how I make a living online Here.